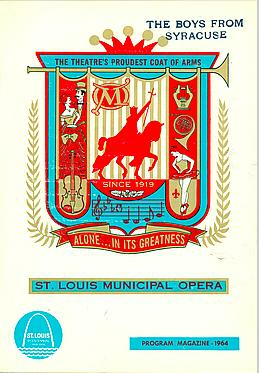 In the research department of the Library for the Performing Arts in New York there is a script for this production, accompanied by notes explaining that the materials that the St. Louis MUNY received from the licensing agent were a shambles that had to be reconstructed and some things could only be guessed at. The production seems to have ended up as a mix of the original version and the Off-Broadway version. The "Ballet Bachannal" that ended the first act seems to have been based on the same general idea as the "Ladies Choice" ballet from the Off-Broadway production, but we don't know if the same music was used. "I Wish I Were in Love Again" from Babes in Arms was interpolated into this production for Mary McCarty, who played Luce.